is a non-profit organization working to preserve the legacy of once exsisted light railways. We publish one or two photobook a year, compile the report of lectures at Keiben-Tetudo-Mokei-Matsuri ( Narrow Gauge Modeling Festival ), and supply goods at the Festival. Our projects are done by voluntary work, and the sales are to be donated to restoring work of narrow-gauge locomotives, cars and tracks like RASS association. More than 100 years ago in Taiwan (Formosa), truly amazing logging railroad was planned under the rule of Japan. This 30 inch-gauge line of 45 miles, climbs up to 7000 feet sea level with triple spiral line and 4 switchbacks (zig-zags). To haul trains up the steep line over 50‰, 20 shay geared locomotives were imported from the U.S. and 18 of them were still in use in late 1960s. Also powerful steam skidders/yarders were introduced to pull huge logs up to the logging line on the ridge above clouds. 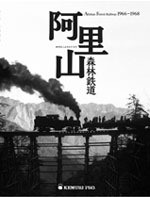 In 1966, during the days of martial law in Taiwan, three of Kemuri Pro members visited this railroad, and in the following 2 years over 2500 photographs were taken under the difficult conditions. This new book on Alishan with selected 170 photographs will surely attract you if you are interested in logging railroads or geared locomotives. 144 pages, all photos in black and white, one color illustration of mountains, with several maps and illustrations of shay locomotives. text; Japanese.